The focus of this costume is essentially the helmet with the body armor as a secondary focus. There are two main helmets in the game, this custom one, and the Russian K6-3 helmet. I wanted to make my own helmet, and the K6-3 is somewhat boring, so I decided on the Ranger helmet. 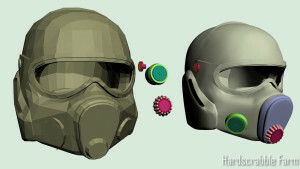 I was able to find a basic pepakura file for the helmet on the 405th Forum. The first thing I did was scale it to fit my head. Luckily I had been able to borrow a buddy’s 3D scanner. Having a digital copy of your head makes scaling your helmets a LOT easier! After scaling it, I had to remove a bad warp in the pepakura model. 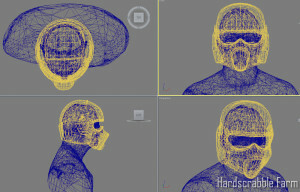 If you look at the top view of the helmet wireframe, you can see that the helmet model is slightly skewed. Luckily the warping was easily fixable. There wasn’t a lot of detail in the original model, so I set about increasing the detail by rebuilding it using Wings 3D and 3DS Max. I used Wings 3D to smooth the geometry of the shell. You can lock hard edges. This will keep the detail intact as you smooth the rest of the geometry. 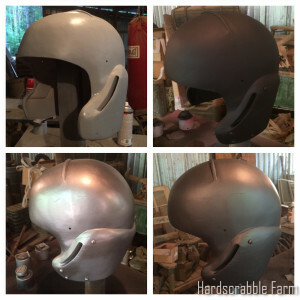 This photo shows the original pepakura file versus my smoothed/detailed helmet. Note: I don’t have a lot of success with using the Boolean feature in 3DS Max, so I don’t merge/cut geometry until I import the model into NetFabb. After I was happy with the detail in the model, I took it into NetFabb for booleaning the details, and to cut it into printer sized chunks. This helmet required a total of 16 pieces. After printing & assembling, I used Bondo, Bondo Glazing Putty, files and sandpaper to smooth the print. Note: I can go into my surface prep in more detail if people are interested. This photo shows the four main staged of paint. I start with Filler/Primer from the auto parts store. That is followed by flat black Rustoleum. I use a “Universal Silver” paint from the auto part store to simulate the metal. This is topped by a THIN coat of Testors Gunmetal Metalizer paint. One step that I neglected to take photos was the process of adding the detail trim around the goggles. I used sheet styrene to create the stepped edge treatment around the goggles. Once the paint is dry, you buff the surface using a cotton cloth. 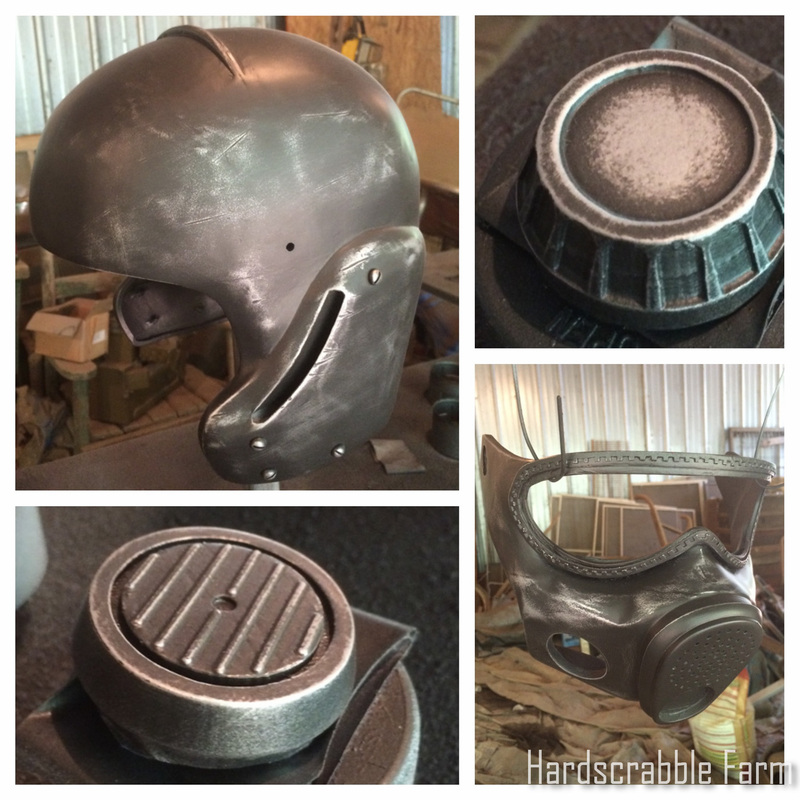 This gives the paint a slightly satin surface like the helmet has been handled. The the fun begins. You use 0000 steel wool to distress the Gunmetal paint. 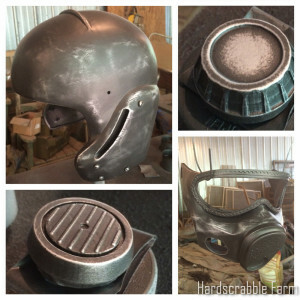 Buffing the high wear areas and edges with the steel wool gives the helmet the look of a steel helmet that’s seen a hard life. Once I was happy with the distressing, I applied a coat of Metalizer Sealer. 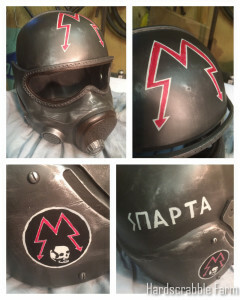 Hand painted stencils on helmet shell. I followed the sealer with hand painted stencils, acrylic paint grunge washes, and dry brushed highlights for the really worn edges and bolts. 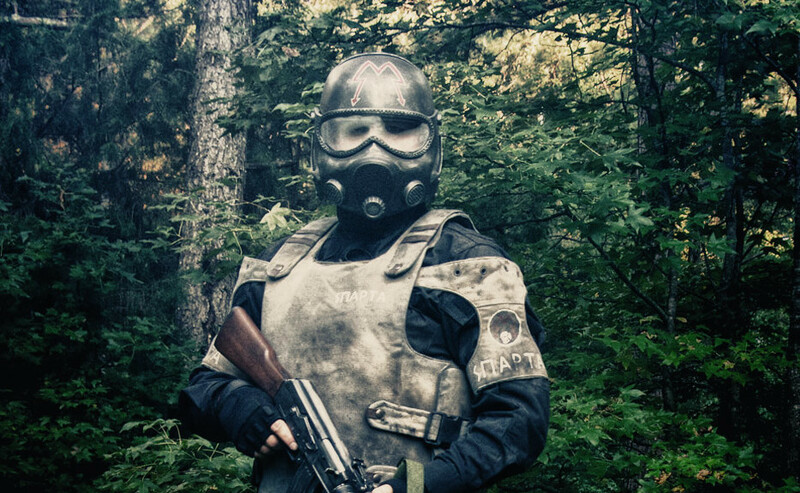 As far as I know, the body armor used in Metro 2033 is not based on a real set of armor. 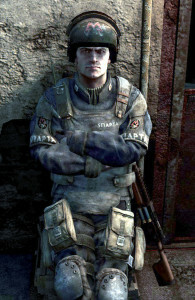 That meant I had to make the armor from scratch to get the right look. I used a plate carrier that I already owned for airsoft to make basic pattern & then modified that to match the details & dimensions of the game version. I used upholstery fabric for the construction because it had a nice heavy weave but was still quite soft. 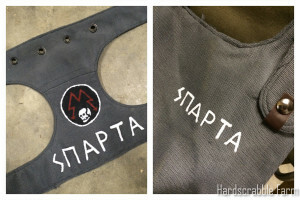 I couldn’t find the right color of grey, so I ended up using khaki fabric that I spray painted using fabric spray paint. 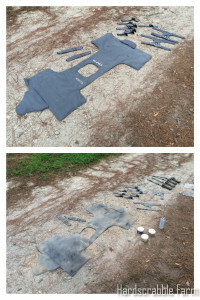 Armor pieces after assembly. 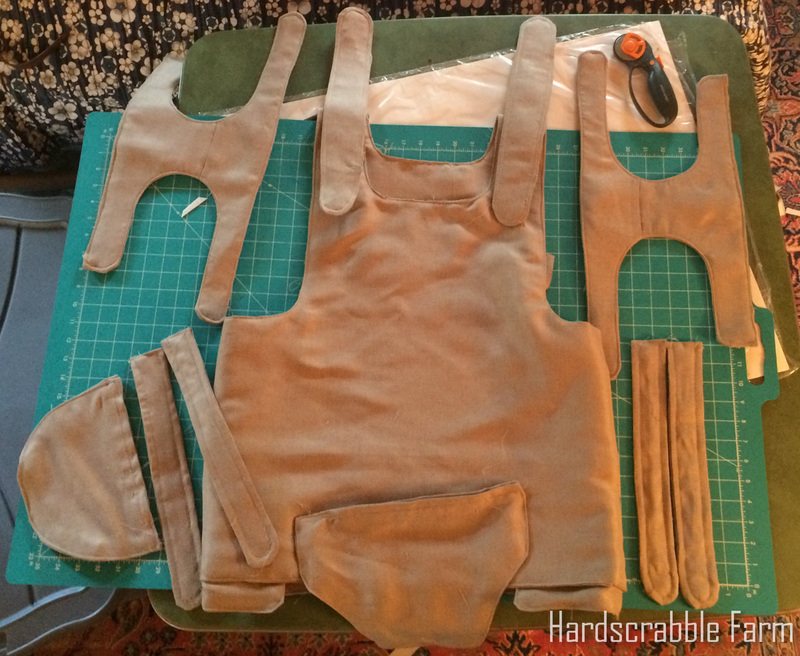 Ready for fabric spray paint and fasteners. 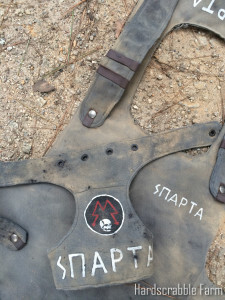 Insignia painted on the armor. Not it’s ready for weathering. Weathering was simple. I just added dirt from the driveway, and some Ben Nye Charcoal powder. I sprayed the armor with matte varnish to make sure the dirt would stay on the armor. 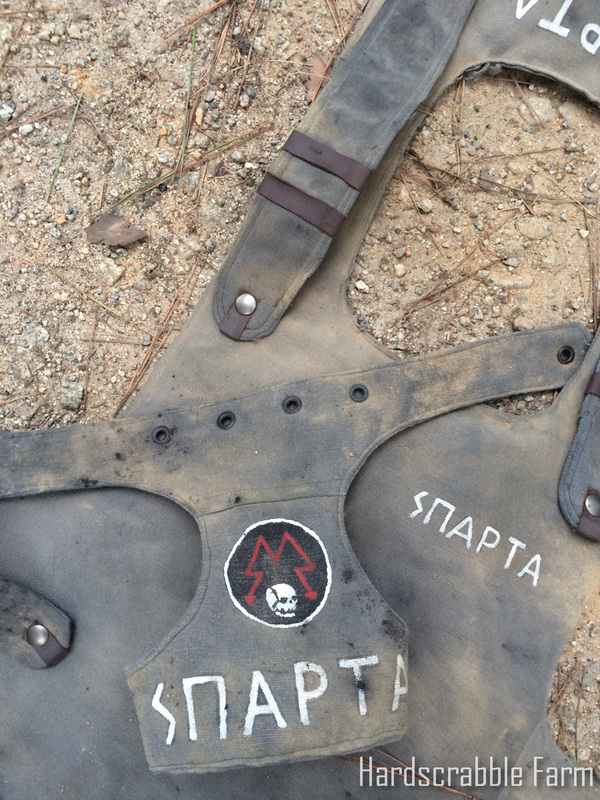 Here’s a closer view of the weathered vest. The Ben Nye Charcoal powder is very dark! I had to sprinkle it from about 3′ up and then knock most of it back off. I’ll make a weapon that’s unique to the game later, but for now, the AK-47 with scavenged tactical light will have to do. 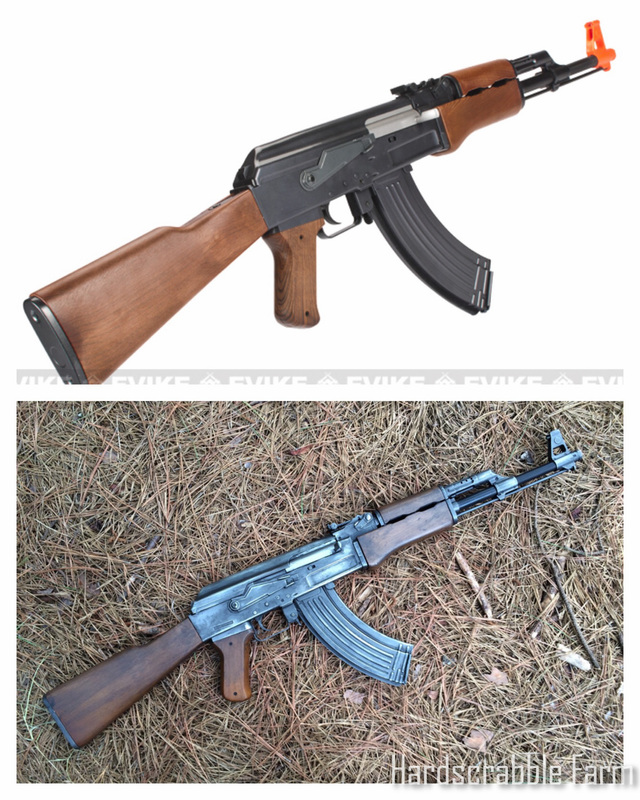 I used the same basic paint technique on the AK-47 and the flashlight as I used on the helmet: black primer/silver/Metalizer Gunmetal/distressing. 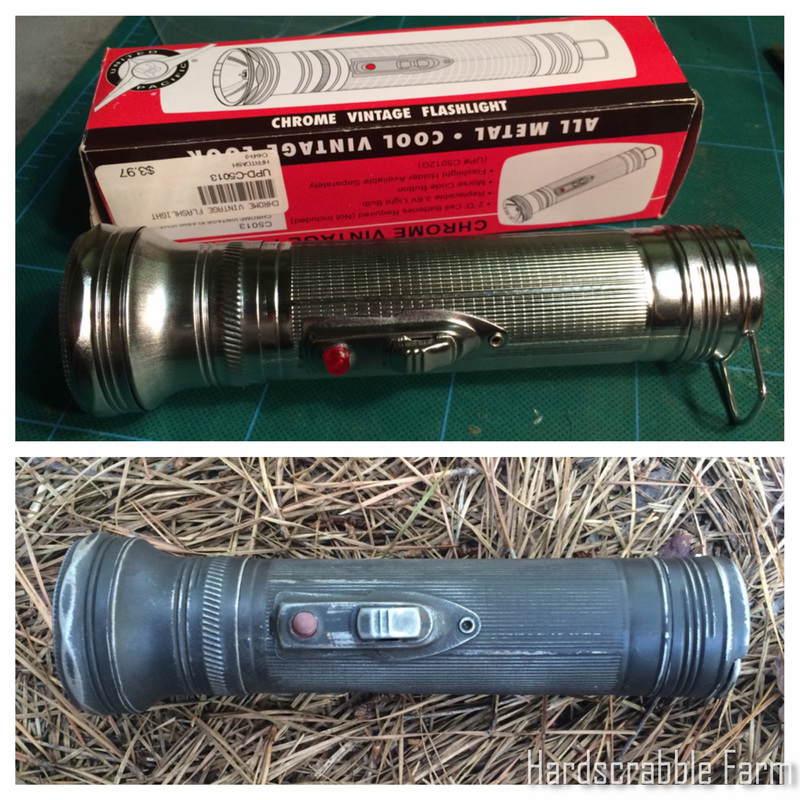 Before/after photos of the $3.97 retro flashlight from Summit Racing. 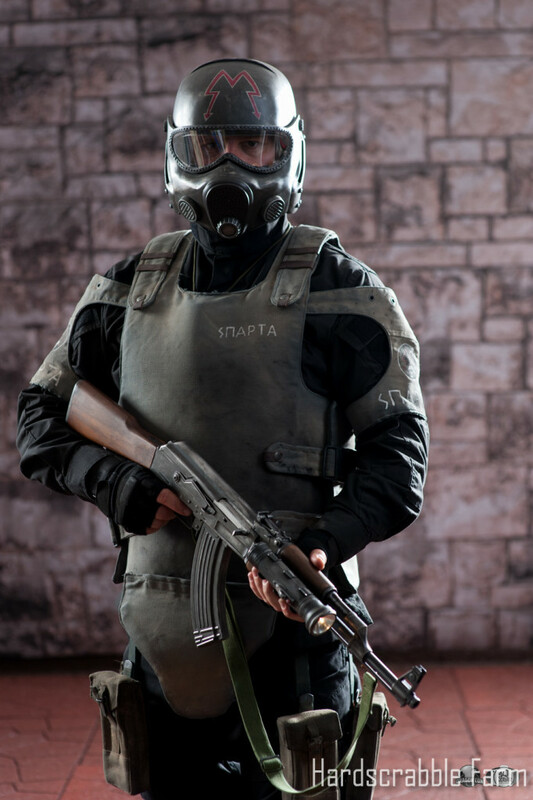 The leg pouches are overdyed Israeli UZI ammo pouches that are attached to leg straps and web straps that attach to the belt. 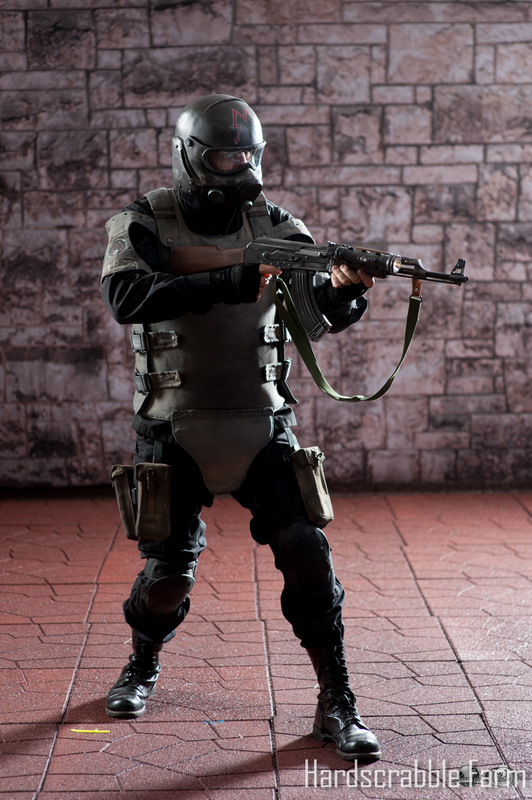 Complete Costume photographed by Bryan Humphrey at DragonCon 2015. You can see more photos of this costume on Hardscrabble Farm’s Facebook page. 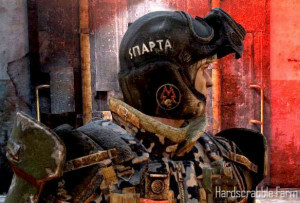 Is there any way for someone to buy that helmet? Not right now. I did not make a mold before I painted it. I am debating releasing the .stl files so people can print their own. I’ll reply later if I do decide to do that. Hello bro, can u upload dimensions of the clothes on my email? For the goggle lenses: did you simply use a lens for something like ski-goggles? 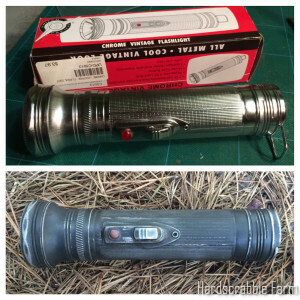 Or did you custom cut and fit a lens from a certain type of plastic? The unique shape of the respirator and eyes makes me cautious of just buying goggle lenses and hoping they fit correctly. Love the work, by the way. Incredible job. Surpasses my techniques by far, I never even figured to try 3D printing. The lenses were just the clear plastic used for vacuum forming. I created a cardboard template based on the 3D printed goggle edges, then used that to cut the plastic. I would be very interested in an .stl file for printing one of those helmets, that looks stellar. 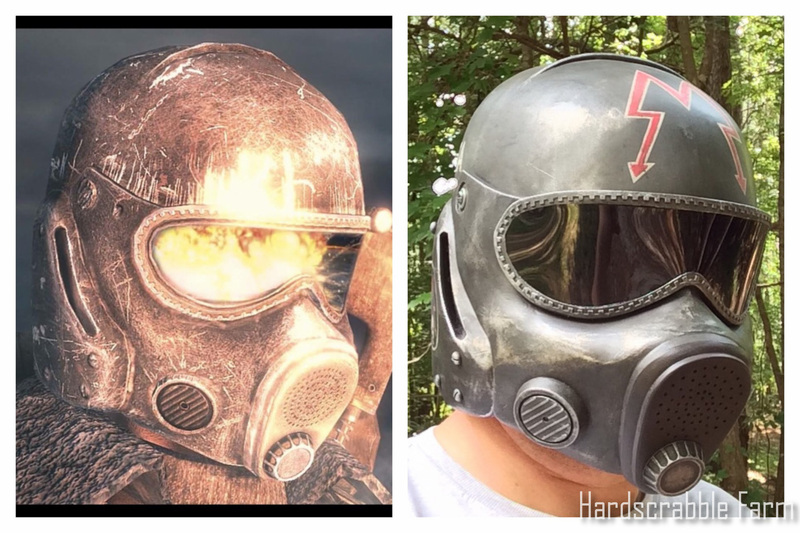 Any chance you could upload the STL you made for the helmet? 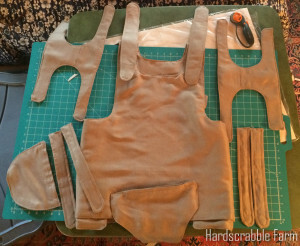 Ever think of making the armor for any body else? Sorry, I don’t do commissions.